I've been making hummus over and over again over the past few months ever since I first blogged about it. As part of the meze dinner on Saturday, I made it yet again and still I have to say that I have absolutely zero complaints; mashed by hand or made in the food processor, the recipe always makes for a great appetizer. HOWEVER! I think I've now found a new favourite as far as my homemade dips go. In fact, I've been thinking about making this eggplant dip for the longest time now, but for some reason never got around to it. Shame on me, though, because I hardly doubt that there's a better dip out there haha. 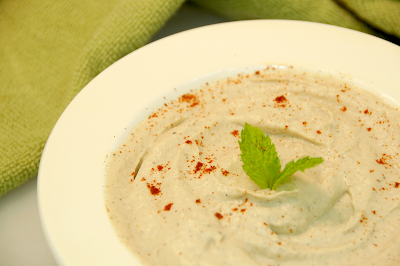 Well, the Kashk-e-badamjan is a close competition, but because of it's lighter flavours, Baba Ghanoush definitely takes the mark. As with Kashk-e-badamjan, roast the eggplant on an open fire until all sides are blackened and the eggplant becomes a little floppy. Cool completely before peeling the blackened skin off the eggplant. It helps to keep the eggplant flesh on a bunch of kitchen towels for a while to drain away the excess juices. Combine the remaining ingredients with the eggplant in a food processor and pulse away until it forms a smooth paste. Alternatively, mash away using a potato masher. Sprinkle with a bit of paprika or sumac and serve at room temperature.